With not much more than a week before the City Council elections, residents of the sixth ward report a flyer addressing the controversial problematic record of Carmelo Garcia in the Hoboken Housing Authority surfaced in mailboxes. 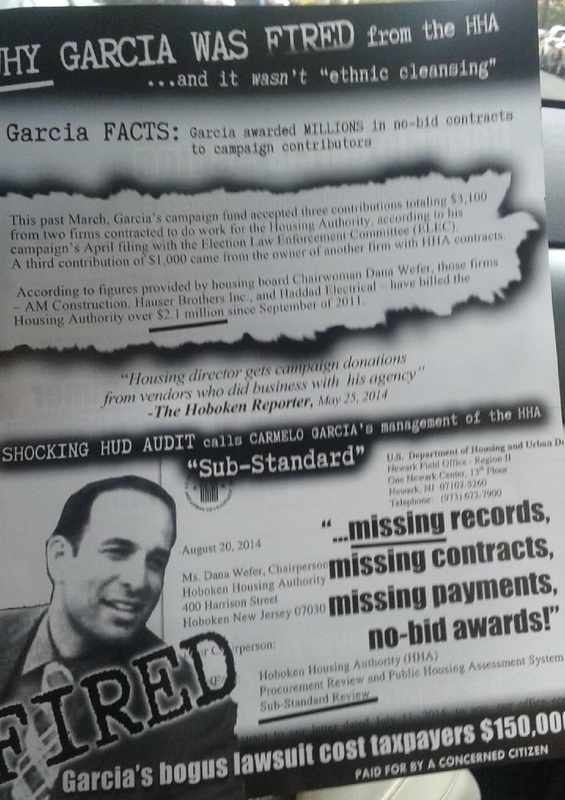 An incomplete sample is seen below stating, "Why Garcia was fired from the HHA" listing a number of factual problems uncovered leading into the termination of his contract in August 2014. Ironically, the political flyer comes out as an expected story from the Hudson Reporter is anticipated to stir up the election more focusing on early 2013 emails of HHA members and the mayor's husband, Stan Grossbard. Although the emails discussed measures to deal with Garcia's intractable procurement methods some HHA commissioners found problematic, the legal counsel for the HHA at that time, Charles Daglian created the generous terms pointing to what Garcia said was his unilateral authority in procurement decisions. Garcia would attempt to renew Daglian's HHA contract at least a half-dozen times with the HHA commissioners frustrated at the contract being continually rammed down their throat over months. One of those commissioners at the time, Eduardo Gonzalez is a running mate of Garcia with the Russo faction. As an HHA commissioner, he voted at every opportunity approving Garcia's attempt to renew Daglian's contract. Mention of an idea put forward by Grossbard suggested renegotiating the lopsided contract terms for Garcia by terminating and updating it with the more typically measured terms in other housing authority contracts in NJ. In the following year and a half, a board of reconstituted new members installed Dana Wefer as chair leading to numerous problems uncovered of an illicit nature further undermining the board's trust in Garcia's heading the agency. Some of those findings by both the board and an independent audit are highlighted in the flyer. In August 2014, Garcia's contract was terminated but not before he began a series of lawsuits claiming "ethnic cleansing" by Mayor Zimmer. Talking Ed Note: MSV has no idea who the 'concerned citizen' is behind this flyer. It's most unusual for residents in Hoboken to do fact based flyer distributions during elections. Typically, these pop up flyers were Old Guard creations that were Mason family underwritten in recent years. Factual wasn't the watchword when it came to those midnight flyer efforts. The timing of this piece too is unusual. Expectations were set for the usual anti-Reform hit job from the pro Old Guard Hudson Reporter before an election. With the early 2013 emails on Hudson County View yesterday obviously leaked by Carmelo Garcia in the ongoing "ethnic cleansing" litigation, the timing of this Garcia flyer is more intriguiging. There's a very long list of people who would be happy to see the listed facts out on one Carmelo Garcia. Your guess is as good as anyone's on the flyer's creator. Carmelo Garcia might perhaps like to strike back releasing an audiotape secretly taken of that citizen - if only he can find out who it is. There's more references to "ethnic cleansing" and quotes that Garcia lawsuit with directed references several times about "white" people. He's not only cost Hoboken people $150,000 to date with his ethnic cleansing lawsuit, he wants more of those peop's money. Mister Carmelo wants to keep at least one hand in your pocket extracting money while he "represents" you. Old Hoboken, newcomer and everyone in-between alike.